A devastating first-half display from Hearts sank 10-man Hibs at Tynecastle. 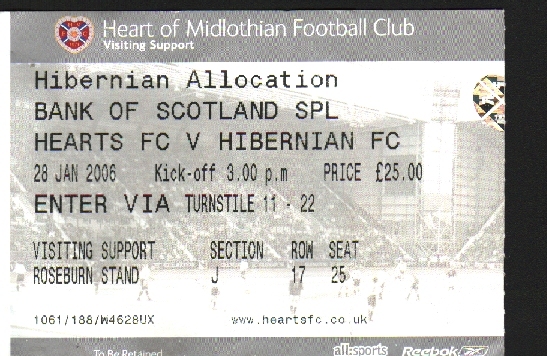 Paul Hartley stabbed in the opener after 27 minutes and Rudi Skacel fired in the second from the edge of a packed penalty area 14 minutes later. Hartley made it 3-0 from the spot (44), before an off-the-ball incident resulted in Gary Smith being sent-off just before the interval. Skacel set up Calum Elliot for the fourth (50), while Garry O’Connor bulleted in a consolation for Hibs. The 126th competitive Edinburgh derby was preceded by a minute’s applause for former Hearts chairman Wallace Mercer who died earlier in the month with cancer. When the game got underway, it was Jambos keeper Craig Gordon who had to make the first save of the game after six minutes. The Scottish internationalist threw himself smartly to his right to save a powerful Garry O’Connor header from a Derek Riordan free-kick. Gordon pulled off an even better save moments later when he punched away Riordan’s first-time drive after the Hibs striker had been set up by O’Connor 16 yards from goal. There was no let-up in the action and at the other end Hibs keeper Simon Brown saved comfortably from Skacel’s left-footed drive from the edge of the box. With Scotland manager Walter Smith watching from the stand, Hartley did his international hopes no harm by grabbing the opening goal. Skacel made his way to the by-line and cut the ball back and there was Hartley to stab home from close range at the front post. Five minutes before the break, Hartley swung in a free-kick from wide on the left which was knocked out to the edge of the box inadvertently by Christophe Berra and Skacel followed it up to thunder a left-footed shot through a crowd of players and past Brown. There was more drama three minutes later when Hibs defender Gary Caldwell hauled Skacel down for a penalty. More drama ensued just before the half-time whistle when Hibs veteran Smith was shown a straight red card for a clash with Saulius Mikoliunas. The Gorgie side had no intention of sitting on their three-goal lead and indeed added to it only five minutes after the interval. Skacel all too easily beat Easter Road full-back Steven Whittaker down the left and when his cut-back came into the six-yard box Elliot had the easiest of tasks to slip the ball past the helpless Brown at the near post. However, the shell-shocked visitors stemmed the tide a little shortly after, when O’Connor turned and drilled a superb 25-yard drive past Gordon. The home fans were encouraging their team to go looking for more goals, but there was a surprising reluctance from the Hearts players to push home the numerical advantage. The game, in fact, petered out with both sides content to run the clock down.